FREEKEH produced “farik” is an Ancient grain from the Middle East. Legend has it that freekeh was discovered when a village in the shams area (also known as the Levant) came under attack. The attacker’s burnt everything in the village including their crops. Once the siege was over the villagers went to their young wheat crops, with little to no hope that anything could be done with the burnt young kernels. In despair, they rubbed the shafts of the wheat in their hands to remove the wheat kernels with a hope that maybe they could use it to make it through the season. Little did they know that this would become a dish that would be passed down from generation to generation and a hallmark of middle eastern cooking for Thousands of years. The food is commonly prepared from immature grains of durum wheat when the grains are still milky. The stage at which freekeh is prepared is very critical. The moment the leaves start to turn yellow and the seeds are still soft and creamy is the ideal moment. It’s a dish popular in Syria, Palestine, and Jordan and one can find the most famous freekeh dishes in Turkey and Egypt. In Tunisia, Libya, and Algeria is actually its course ground barley. So I asked my husband to take me shopping to find the real freekeh, cause I thought at that time the one I had was an imposter. When asking the merchants regarding freekeh I found out it was just ground barley and not the green wheat I was accustom too. So now I know before travelling to Libya pack some freekeh for the ride. 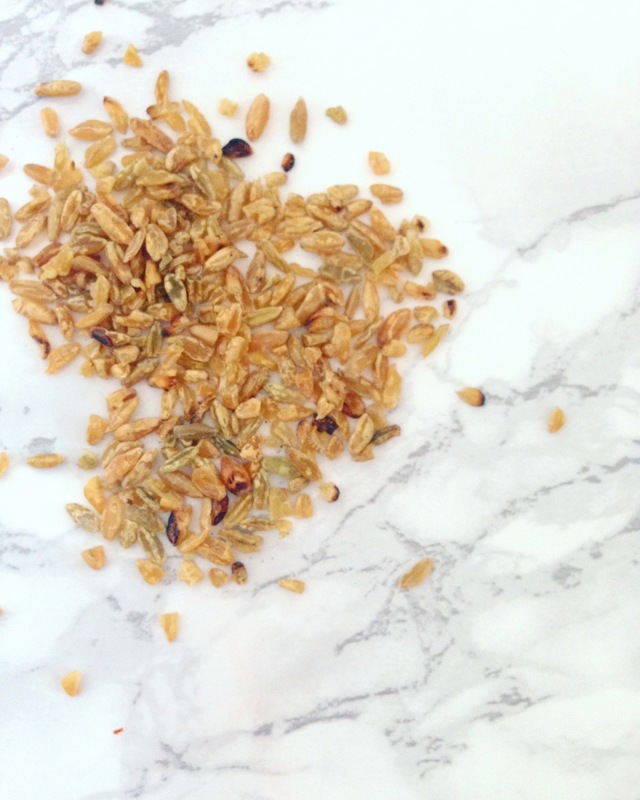 Freekeh is high in vitamins, minerals, fibre, and protein. Actually, it’s even higher in fibre and protein than brown rice and quinoa and let’s not forget it as a low glycemic index, plenty of resistant starch, low in gluten and has pre-probiotic properties. Talk about a superfood or what? so now the main question…..
First, you must clean the freekeh before using. spread the grains on a baking sheet and pick out any stones or shaft. Place in a strainer and give it a rinse under running water. Spread the grains on a baking sheet and pick out any stones, shaft or really brunt hard pieces. Fill a bowl with water and remove the floating bits. Do this a few times. Then drain with a strainer. To cook the grain you use a ratio 1: 2-1/2 cup. 1 cup of dried grain will come to 3 cups of cooked grain. Add one cup of washed and cleaned freekeh to a pot then pour in 2 1/2 cups of water or stock. Bring to a boil then reduce heat to a slow simmer cover and cook for up to 60 minutes. Check every 20 minutes to ensure the grain aren’t stinking to the bottom and to ensure that the grain has not gone dry. * avoid stirring the freekeh during cooking, this can result in a gummy texture like oatmeal vs. wheat berry texture that you’re looking for. 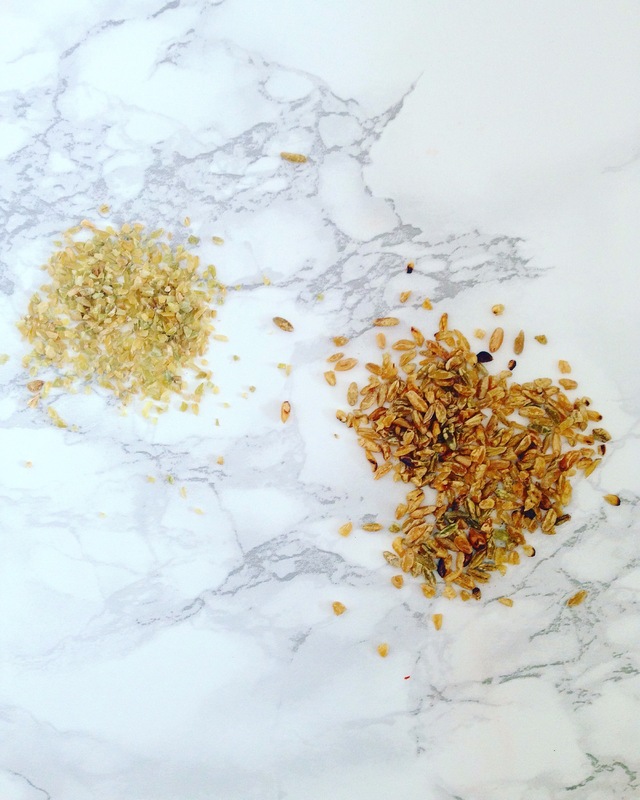 you can store cooked freekeh in the fridge for up to 1 week or 3 months in the freezer. I personally make a large batch and freeze it for later use. you’re going to follow all the direction of the first steps except the cooking time. The grounded freekeh cook in half the time, 25-30 minutes and you’re done. Same as rice: stuffing, salads, veggie burgers and etc. * The smokey taste of freekeh pares really well with cinnamon, cumin, allspice and 7 spice. Meats used with freekeh; Lamb, chicken, turkey, and beef.